When you are overweight it is common to feel bad about your weight, and to feel overwhelmed at the task at hand. Here, we share the TOP FIVE things to FOCUS on to FEEL BETTER. 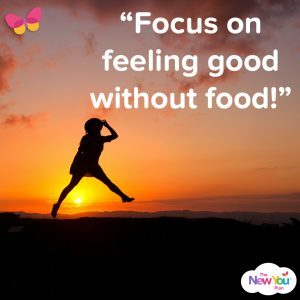 This post will give you some positive tips on how to stop feeling bad about your weight, and start to feel more positive and happier about where you are now and more importantly where you are going. One of the best quotes for changing how you feel is this…. Sometimes the only thing you need to change is how you look at things to stop feeling bad about your weight. When you realise this, it takes a lot of pressure off you. You don’t have to wait until you drop 4 jeans sizes to feel better. 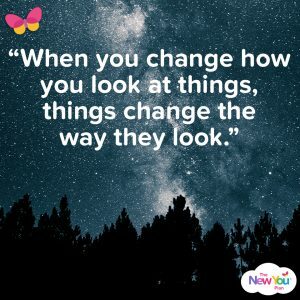 All you need to do is change how you look at things. OK, so you might not have the body of your dreams…yet, but you are much more than your weight, and you need to focus on what you do have, and appreciate everything in your life. Feeling blessed for all the great things in your life is one of the quickest ways to change how you feel. Good health, loving relationship, nice home, good family, job that you love, garden that you love, good friends, holidays, skills, talents, hobbies, pets, achievements, upcoming events or experiences to look forward to. Focus on all the amazing things you have in your life, and feel grateful for everything. Being slim isn’t everything, and best way to find happiness in your life is to appreciate every thing you have. It is also important to focus on how far you have come. 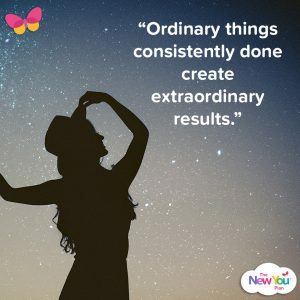 What have you already achieved on your weight loss journey?? Take pride in what you have already achieved and on how far you have come. 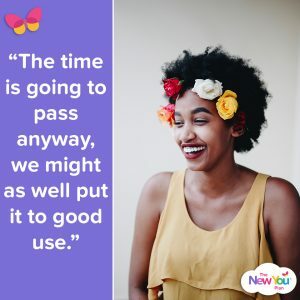 If you have put on weight due to an illness, divorce, or some overwhelming emotional event, then feel proud of yourself for any achievements and progress you have made in healing and moving on. Set yourself mini goals, whatever your situation is, as long as you are improving, feel proud. Losing weight and living a healthy active lifestyle are not events; they are the results of a process. The process of losing weight is following The New You Plan consistently. When you do this for a matter of short weeks and months then you will get to where you ultimately want to be. So if you are feeling bad about your weight, ask yourself, did I follow the plan today? If your answer is YES, then feel good that you are on the right path, and make it your focus to do the same tomorrow. Take control and take responsibility for following the process 100%. You can have results or you can have excuses. There is nothing in the process that is outside of your realm of abilities. Take 4 products per day, drink 3-4 litres of water per day. That is it. All you need to do is focus on following this very simple process. 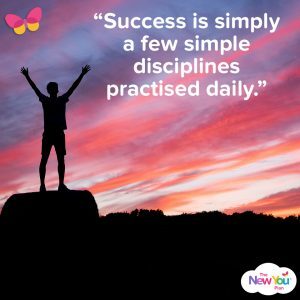 Every day you follow it, you will be building self discipline. Self discipline = self esteem, and when you have self esteem you will never be feeling bad about your weight again. When you nail the process, you have nailed success. If you want to be slim and break addictions to food, follow the process of Total Food Replacement. If you want to get fit, exercise everyday. Whatever goal you have, there is a simple process to follow. We all have a habit of overcomplicating things and making them feel harder than they really are. So the best thing we can do is just focus on the simple process at hand. Follow it, and everything else will just happen as a result of it. Too many of us put too much focus on feeling good with food, and that is ultimately why we are feeling bad about our weight now. You have to realise that if you are feeling bad about your weight, that the worst thing you can do to feel better is comfort eat. You need to break this vicious circle. This is why total food replacement is suited to people who comfort eat and turn to food for to make them feel better. Having a total break from food, gives us time to break our addiction, clear our palette, and time to review our relationship with food, and more importantly to form healthier habits and ways to feel good and deal with our emotions without turning to food and drink. You need to think of stress free strategies that are suited to your lifestyle and desires. We cover this topic in our online video coaching program 7 day Kick Start (worth £47, which all customers get for free when they order). Go for a walk – Emotion comes from motion: More often than not a good brisk walk will make you feel brighter, more positive, more energetic, more healthier, and happier. So next time you are feeling low, get up, get out, and get some fresh air. This is one of the best habits that you can form. Spend some time on your appearance to look and feel better: Maybe fix your hair, make up, skin, nails, have a shower, wear something nice. Just spruce yourself up a little. This is better than opening the fridge door all night long. Why not spruce yourself up and go and call round for a cup of tea with a friend or family member? Pamper yourself: Highly overlooked is booking in some ME TIME, and this is especially important for busy mums and dads. Ask for some help and support so that you can relax, have a nice bath, an early night and curl up with a good book. Declutter your house: Out with the old and in with the new. Sometimes just giving your house a good clear out can make you feel a hundred times better. Start with your bedroom, your drawers and wardrobes, and work your way around the house. This will give you a great feeling of satisfaction and help to keep you busy. Making space is also a great way to make way for the new. So if you want some nice clothes, throw out the big old ones. If someone called you fat and useless I am sure you would defend yourself! But sometimes we can be our own worst enemies! So watch how you speak to yourself. Always talk to yourself in a positive, healthy, and loving way. Go easy on yourself, love yourself, but don’t accept excuses, laziness or self defeat. You need to be strong, and talk to yourself in a way that will lift you up and keep you aligned with your goals of being slim and healthy. Be proud of your achievements, celebrate the smallest triumphs, do mini fist pumps at the end of every day, give yourself a pat on the back every night, be your biggest fan, love yourself, and take proud in how far you have come, and believe in how far you can go!! It is easy to get bogged down with how much weight you have to lose and how long it will take to achieve it. You really need to put it into perspective. If you want to lose 3 stone, you can do that in 8-12 weeks depending on how quickly you personally lose it. So in 2 or 3 months you will be 3 stone lighter. What will it mean to you to be 3 stone lighter? How will it impact your life? Think about how much your life could change in just 2-3 short months. It is not very long at all, is it??? Where do you want to be in 2-3 months time?? Do you still want to be feeling bad about your weight? Take comfort in the fact that you are in control, and that you can lose weight and get to your goal. 1) FOCUS on what you do have.